Due to their unique properties, chitosan-based materials have emerged as useful resources in a variety of medicines, drug controlled-release carriers, tissue engineering scaffolds, and immobilized enzymes. But many of these materials have yet to reach the commercial market. Therefore, more work must be completed to fill the gap between research and production. Exploring the state of the field, Chitosan-Based Hydrogels: Functions and Applications details the latest progress in the research and development of chitosan-based biomaterials. 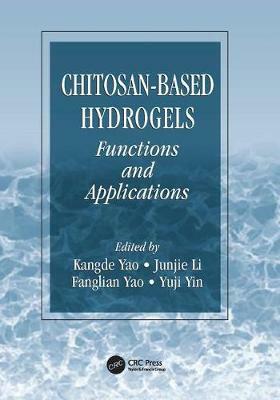 The book introduces the formation and chemical structure of chitosan-based hydrogels. It also discusses the relationship between their structure and functions, which provides a theoretical basis for the design of biomaterials. In addition, many real-world examples illustrate the potential application of chitosan-based hydrogels in various areas, including materials science, biotechnology, pharmaceuticals, regenerative medicine, and cell engineering. By examining the structure and functions of chitosan-based hydrogels in living systems, this book provides the foundation for future research. It encourages readers to contribute to further research and development of these unique biomaterials.